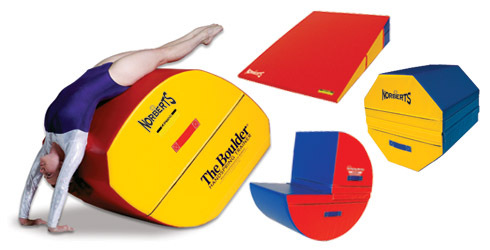 Here gymnasts and their coaches will find a selection of training aids--everything from unique originals such as our revolutionary The Boulder® Handspring Trainer to Norbert's Handspring Machine ("If you didn't buy yours from Norbert's, you don't own a real Handspring Machine") to our Jumbo Octagons & Incline Mats. All are made in America by skilled craftspeople; all components are acquired from reputable domestic suppliers. Each of these--like everything Norbert's manufactures--is designed to fully meet your needs, provide you with years of useful life and conform to our demanding standards. The Boulder® is a registered trademark of Norbert's Athletic Products, Inc.